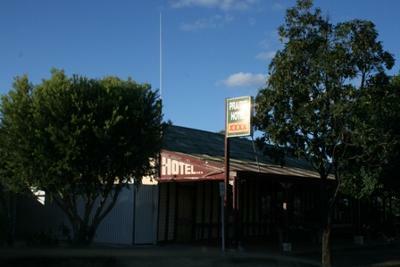 This is a nice outback pub with some great character. HOWEVER - THE OWNERS ARE NOT FRIENDLY SO DON'T EXPECT THE USUAL OUTBACK FRIENDLINESS - THEY WERE ALMOST RUDE. We did not have a nice stay because of their behaviour, and we did not do anything wrong, except, perhaps - didn't go drinking in their pub! We found the prairie pub people to be very friendly and helpful, They must of said or done something stupid to upset the publican, Always treat people how you like to be treated yourself. We stayed here recently and found the owners of the pub were very friendly. We had a very entertaining evening with them. It is the people who stay here for free and who do not come in for a drink, who spoil it for everyone else. We are very experienced RVers and have been travelling for years, so we know what constitutes a warm country welcome. We stayed there and also found the woman rude and abrasive. We ended up leaving without saying goodbye (unheard of for us) because she was so rude. She was not shy - just snappy and irritable and downright rude. She's been doing it for too long, obviously and needs a holiday! BUT, the barman, Tom, was great and very welcoming. We had a beer and then we ordered dinner (not too good!) and we stayed for breaky the next morning so we spent a lot of money - no excuses for her churlishness. The pub is very interesting and has been well decorated in collected pieces to match the era. one has to wonder who all the anonymous comments are from but believe me from one who knows I will never set foot in this rotten run down piece of pub to be ripped off and insulted again!! Just talk to the locals they will tell you! !